that "dark side of the cosmos" well yet. coupling gravity, can explain all the three observed surprising phenomena (a), (b) and (c). The highlights of this web page are summarized in the following PowerPoint Presentation (PPP). Click the following links to see the PowerPoint Presentation. other parallel universes surrounding our universe. parallel Universes is causing accelerated expansion of our Universe A.
earlier years of our universe. "Dark Flow" discovered in 2008 by Alexander “Sasha” Kashlinsky of NASA’s Goddard Space Flight Center. direction of a patch of sky between the constellations Centaurus and Vela. detected in our universe is also caused by such inter-universe coupling gravity. 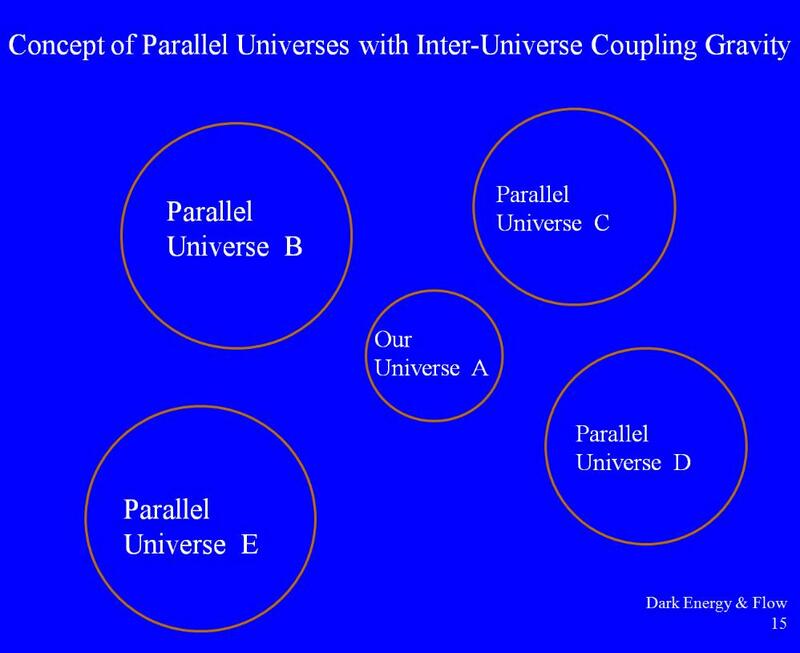 the same plain old gravity - that is the inter-universe coupling gravity. Chinese certificate of a copyright on a mapping table for Chinese Spelling Code. 4G system standard which is also known as LTE (Long Term Evolution). Experiments and Studies," The Bell System Technical Journal, Vol. 59, No. 2, February 1980, pp 183 to 228. December 1971, pp. 3211 - 3270. Vol. COM-20, No. 6, December 1972, pp. 1100 - 1107. 1973, pp. 557 - 581. No. 8, October 1976, pp. 1111 - 1124. Journal, Vol. 57, No. 5, May-June 1978, pp. 1545 - 1568.
astronomers, including Robert W. Wilson, in Bell laboratories at Crawford Hill in Holmdel, New Jersey. He has retired from his professional Telecom engineer job and is living in New Jersey, USA. Laboratory and the High-z Supernova Search Team. state of collective bewilderment since this surprising discovery in 1998.
to increase the rate of expansion of the universe. in the direction of a patch of sky between the constellations Centaurus and Vela. (multiverse) and to the development of String Theory, M-Theory and Big Bang Inflation Theory. surrounding our universe as explained in Section 5.
and into much more challenging and exciting parallel universes or mulltiverse. These science documentary TV programs are very helpful and educational to many people, including me. parallel to our known universe, we are not alone! universe E, etc. as illustrated in the following Figure 1.